The most significant change in Sea Angling history – A 3 Bass daily limit – NOW with added MLS! What has happened to the fishing?? What an eventful week. 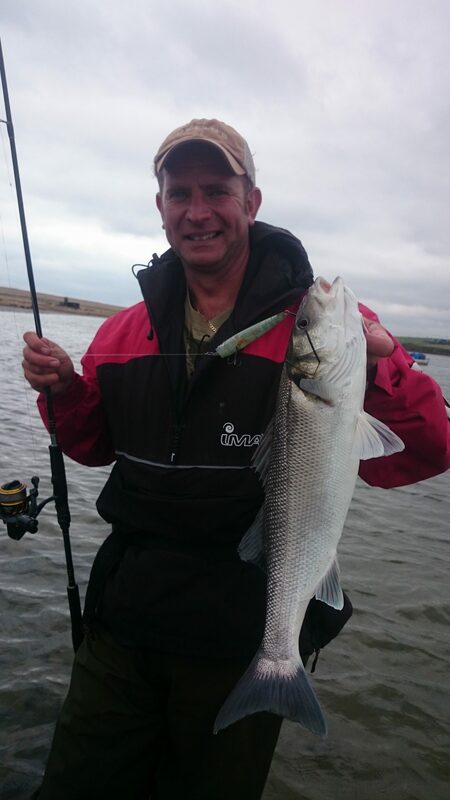 I kicked it off on Monday with a great short guiding session with Adrian Horne, who was after Bass. We certainly found the Bass, and he looks happy with this lovely in the picture below. It fell to a Gunfish surface lure and was one of several Bass, all around the same size. 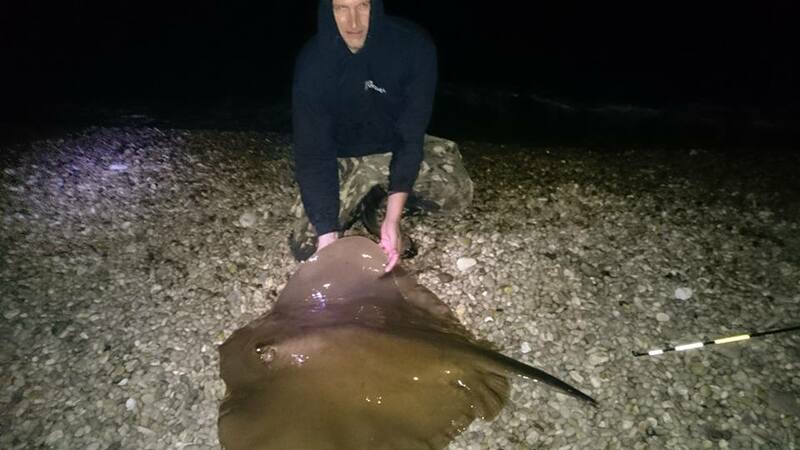 The early part of the week fished really well, with lots of Mackerel and baitfish around, then on Wednesday night Guy Spriggs caught a potential British record Stingray weighing 78.6lb from Chesil. Guy has been in contact with the angling trust to see if he can claim the record, even though he released the fish. The latest news is that the Angling Trust have asked him to submit the claim. Just in case you didn’t see the picture here it is again. As the week has progressed the fishing has become worse. The mackerel seem to have moved off a bit, most likely chasing the bait fish. Fishing for other species has been very tough. I don’t think for one minute, that it is because the fish have moved away. A possible explanation is that there were so many bait fish to be cleared up after the Mackerel had been though, that the fish have gorged themselves and are not hungry at the moment. The good part to that theory is that they should start feeding again today. Lets hope I am right! Chesil Beach forecast: As I mentioned earlier, I think the poor fishing over the past couple will soon be forgotten as another good weekend beckons. Mackerel should be around in numbers. 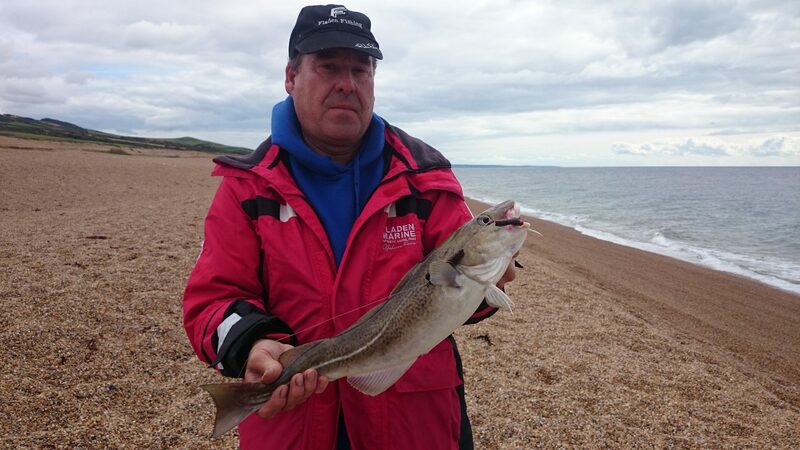 Gurnard, Bream and Plaice fishing should be good all along the beach. With good numbers of Undulate Rays around, it is well worth a try for them in the evening. If you can get Peeler Crab then you are in with a good chance of getting a Smoothound. You do normally need to be hitting a good distance to get out to them. I like to use a 4/0 Pulley rig and use a nice streamlined bait, clipped down behind a Gemini Splashdown weight, to help get that extra distance. If you have not seen or heard of the Splashdown leads and clips, then next week’s review will be of interest to you. I had the first of this season’s Cod this week. I am not sure if I will get anywhere near the 302 I managed last season from Chesil, but I will give it a try. The best bait seems to be fresh Black Lug. Portland: With clear water all around, the Pollock should be back along the rock marks. Add a good number of wrasse and you can expect a good day’s fishing on Portland. Bass are not around the shoreline yet, but they are getting big Bass of the Bill, on the boats. Chesil Cove and Church Ope are both favourite marks for me at this time of the year. Fishing at dusk can produce Mackerel, Garfish, Mullet, Pollock and Bass all on float fished Mackerel strip. On a still night, Church Ope Cove can produce some nice Sole. Portland Harbour: The early part of the week was excellent for Bass fishing in the harbour, but now the tides are dropping, the fishing has dropped off. The harbour will stil fish well for Flounder, and there are a number of large Mullet in the Fleet. Weymouth Bay: The piers are fishing well, as is usual at the moment. Wrasse, Pollock, Pout, Mackerel, Garfish and Flounder can all be easily caught from the pier.